Based on your feedback, you are loving the Custom Menu feature we launched two weeks ago. It’s natural to want that feature enabled for your favorite theme, too. We’re working on adding it to all WordPress.com themes. 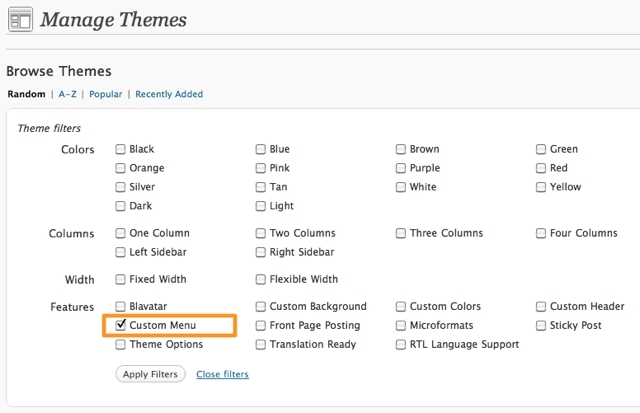 In the meantime, you can find themes with Custom Menu support in Appearance→Themes by choosing Custom Menu from the Feature Filters menu. We’ll also keep an updated list on the Custom Menu Support page. This new menu functionality is great. I was able to remove two widgets — Pages and RSS Feed — from my sidebar when I moved up to the Greyzed theme with the embedded Custom Menu. Extremely handy, thank you! Thanks!! That is awesome! I was waiting for it!! Yes! This is the filter I like: Custom Menu. Love this function! 🙂 So, I am changing my theme to Enterprise in order to use it! Thank you. I am unable to find any such layout for options with checkboxes on the theme Greyzed! Am I amiss here? @vish3116 This isn’t related to a specific theme. You’ll find the filter options by going to Appearance→Themes, then at the far right near the search field, click on Feature Filters to reveal the menu. This will make things easier for sure. Thanks! It’s hard to find the right theme when there are so many options that I like – seems there is no one theme that has it all. I’d like a three column theme with the custom menu feature. Wish me luck. Thanks! Thanks for the update!! it’s getting cooler and cooler, and I am hooked! Love it, saves time for searching a new theme. Thanks for this helpful tip. Looking forward read more from the support page. You guys are doing a great job. I always wanted to add Custom links to the menu title and this addition has enabled me to do it. Thanks heaps. God bless. Good news. I love custom menu feature. New things, ways to increase visitors, so much going on. Frankly, I feel as if I am sinking. Not understanding computer talk, mesmerised by high tech features, I feel I am left behind and powerless to even tread water! My theme Bueno only supports one menu, I wish it supported more. I like the theme, but should I change it to another theme that support more than one menu? That’s not really my idea. What themes support more than one menu? Right now the only theme two have more than one menu is Enterprise. I’m sure that will change in the future as we launch more themes. GREAT! I was wondering the best way to find the themes that have the support for the new menu feature! It seems that my lack of enthusiasm for custom menus puts me in a minority of one. I am struck by this commitment: “We’re working on adding it to all WordPress.com themes.” New WP.com features usually go into new themes, leaving the older ones behind. Making an exception for this feature makes a strong statement. Thanks for your thoughts, Andrew. To be clear, this isn’t an exception—in the past we’ve retrofitted older themes with new theme features (such as threaded comments) and we plan on continuing to improve older themes with features such as Custom Background and image/gallery improvements. You rock! Thanks. This one is superb. Now, we can experiment and create a more personalized theme. I still did not use the custom menu as of yet, but the more options the better, thanks! Thank you! Great job! 🙂 It will be helpfull because i thought how can i easier find what i need! This is great! Now, I finally want to make my own custom menu. Thanks! You know, it’s awesome things like this that make me glad I joined WordPress. Awesome! I still have to check this thing out…but it sounds really neat. I’m hoping to consolidate two or more of my widgets so I don’t have quite so much in my sidebar–and I don’t want anything in my footer! Everybody loves custom features. Thanks WP team! Yes, loving the new menu feature! Thanks again. This is certainly an improvement. Have to be careful that too many quirky things don’t creep in. The featured image option is really temperamental sometimes. But, on balance there’s nothing coming close to WordPress. I like integrating it with SoundCloud – very very neat. Anytime custom is mentioned – I’m all ears. Thank you for this addition to an already incredible list of options we have! Love it! WordPress you are the motor in my blogging car. This new menu feature has been a lifesaver in allowing me to construct my site to display our bible teachings in a list rather than as front page blog entries! Thanks for a great service and for keeping it fresh and lively! Thank you, WP, for being so responsive to our requests! Please add it to Blix soon! I’m really looking forward! I switched to Twenty Ten for the aside feature which is great, but I’d like to have more than one menu – I realise only Enterprise supports this feature at the moment . I’d also like Twenty Ten to support a narrower header image as an option. Thank you, It is helpful for filtering and searching themes. Nice and handy update! Thanks! Thanks. I missed clicking on Feature Filters. My bad. WP.com is getting crazier! -read: better and better! Checked the custom menu a week ago and this is IMO one of the best features that has been introduced. Now let’s get creative with ’em! PS: how long would it take for all the old themes (e.g. Cutline…) to be updated with the menu feature – approximately? Nice, thanks! Should be helpful. I love the menu feature. It’s amazing, and works well. It’s true. I like the custom menu feature. Thanks for keeping up with me. Thank you for the new menu feature. I’m sure everybody loves this… Great job! Do you think you could update older themes (such as Motion) so that they can benefit from the new features that are coming out so fast? I don’t want to give up Motion but I don’t want to be left out when new features arrive. Yep! We don’t want you to be left out either. We’ll be going through the theme archives and carefully updating older themes with new features like Custom Menus. Great feedback. I’m a rookie-blogger but a menu is something my blog is lacking. Not sure if it will work on the Black Letterhead theme but we’re going to give it a shot. Recently used this feature to make my blog much easier to navigate. VERY nice feature. Didn’t really see the potential at first, but then caught on. Thanks for this. Thank you very much for the custom menu feature. It’s very helpful and makes it easier for me to free up my sidebar. Much appreciated! I have a suggestion: can you make it so all themes have a place where there is an icon that links to Twitter/Facebook/Flickr? I’m using Titan and it doesn’t have Facebook and I’d really like it if you could do that. Thanks! Good custom filter… I like it! I LOVE the custom menu theme. Thanks a lot for it! Customizing my menu was so great, love it. I love the custom menu thing. It changed everything! Thank you! The custom menu feature was really helpful, especially how the Greyzed theme allows for dropdown menus. I just hope you could extend not just the custom menu but also this dropdown menu function for other themes as well. Really, it helps to make a blog look orderly. thanks! Looking forward to more themes including excerpts feature. Keep up the good work!